Thus it was that, during the Soviet period, a citizen of the USSR was neither wholly ethnic, nor wholly Soviet. The national consciousness of the USSR’s many ethnic groups was never extinguished; and historic Russian identity – whatever had survived the Romanovs – was an ill-defined concept. When the USSR collapsed, what was left was an economic sinkhole, an ideological vacuum and an identity crisis; repairing the economy was one thing, but what was to be the ideology and identity of all the ‘new’ countries that had once been part of one big happy Soviet family? Irony of ironies, the ethnically-based former Soviet republics had something to build upon, but what about Russia, at the centre? Should one replace the vacuum in the new Russian nation with Russian nationalism? Yet what did being ‘Russian’ mean? Ethnic Russians living in the new Russian Federation; or ethnic Russians living in any country of the old Soviet Union; all Russian speakers? If everybody else was setting up their nation states on ethnic principles, then why not Russia? Because, even if one could come up with a formula for defining who is ‘Russian,’ the danger of creating an ethnic Russian identity – some sort of ‘Russianness’ – is that it marginalizes and alienates non-Russian ethnicities living in a multi-nation, multi-faith country. In December 2012, Vladimir Putin signed his new Nationalities Policy Strategy, a presidential decree that replaced the 1996 Concept of State Nationality Policy. 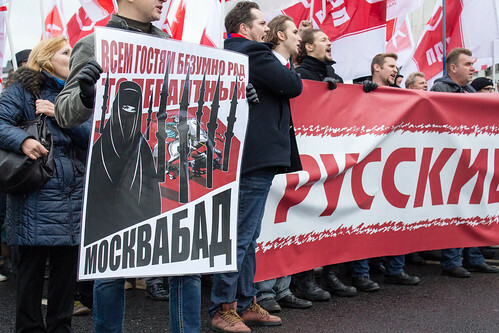 The new document is littered with references to patriotism, and talks of a ‘Russian [rossiiskii] political nation.’ In Putin’s Russia, a model Russian is defined by his or her embrace of civic values, and not by clinging to ethnic atavism. However, trying to take ethnicity out of what defines a Russian might be a tall order in a country with so many ethnic groups. Russia – the Russian Federation – is exceptionally diverse, with over 170 ethnic minorities, from Koreans to Finns, from Tatars to Armenians. In the 2010 census, 80% of those who indicated an ethnic affiliation, declared themself to be Russian, followed by Tatar (3.9%), Ukrainian (1.41%), Bashkir (1.16%), Chuvash (1.05%), and Chechen (1.04%); with numerous smaller minorities making up the rest of the population. Over 100 languages are spoken in Russia, and although Russian is the only official language for the whole country, some minority languages are recognised as official at a regional level. As for religious affiliation, ethnic Russians profess their Russian Orthodoxy, but in 2010 there were also more than 16.4 million Muslims in Russia, as well as members of numerous other faiths. What, then, are the most obvious civic values of this ‘new’ non-ethnic Russian patriotism? Well, they draw on symbolic elements of Russia’s history: the pre-Soviet Russian flag (reintroduced in 1991); an adaptation of the old Soviet anthem (reintroduced in 2000). And on state TV, and in state-financed films, the promotion of Russia’s cultural and historic successes is often visible. But that is not much of a foundation on which to build a proud nation state. Anti-Western propaganda has always been a popular way of unifying Russia’s squabbling ethnic groups. Defining the foreigner, any foreigner, as a dangerous ‘other,’ has been going on since the time of Peter the Great’s father, Alexis I, who established the German Settlement (all foreigners were called ‘Germans’) outside Moscow. All foreigners had to live within the Settlement so as to protect the purity of Russia’s cultural values from contamination. Recent anti-western moves in Putin’s Russia have included: increasing restrictions on the activities of Russian NGOs, labelled as ‘foreign agents’; a law banning the adoption of Russian children by American families; sanctions against US citizens who commit crimes against Russian citizens; the suspension of activities by US-funded NGOs in Russia; banning membership of Russian NGOs by US citizens. Reactionary, flag-waving politics have been a recurring theme in Russian history: Sergey Uvarov under Nicholas I; Pobedonostsev, under Alexander III; Plehve, under Nicholas II; the rallying cry (devised by Uvarov for Nicholas I in 1833) much the same: “Pravoslavie! Samoderzhavie! Narodnost!” – Orthodoxy! Autocracy! Nationality! In 2013, and with such a history, the question remains: can this novel form of Russian patriotism ever be entirely civic? Russia’s ethnic minorities could be forgiven for seeing this avowedly modern, neutral and civic patriotism, as nothing more than a covert process of old-fashioned Russification. The 1996 Concept of State Nationality Policy stressed the, ‘unifying role of the Russian [russkii] people.’ The 2012 Nationalities Policy Strategy says much the same thing, noting that the Russian people historically represent the ‘backbone’ of the union of peoples that constitute the present Russian state. There are numerous references to the protection of minority languages and cultures, but these are very vaguely phrased. Building a non-ethnic nation, apparently, takes time – the more time the better, perhaps: an initial meeting on the implementation of the Nationality Policy was convened by President Putin on 19th February 2013. The Nationalities Policy Strategy unambiguously confirms the primacy of the Russian language, continuing a trend consolidated in recent years. New regulations on education, adopted in 2007, and revised in December 2012, have reduced the regions’ autonomy over the teaching of minority languages and cultures. A 2009 presidential decree removed the option for secondary school students to take their final exam in a minority language rather than in Russian, which is likely to stimulate a further shift towards education in Russian for members of national minorities. In 2007, the Russian Government also promoted the programme ‘2007: Year of the Russian Language in the Russian Federation,’ and talks in schools about ‘patriotic education’ were introduced in 2012. Over the years there have also been recurring calls from ideologues to ‘de-ethnify’ Russia’s federalist political structure by reducing some or all of its ethnic administrative units. Between 2005 and 2008 there was a series of mergers of ethnicity-based autonomous (districts) with predominantly Russian super-regions; and discussions of the advisory committee drafting the Nationalities Policy Strategy reportedly floated the idea of abolishing all ethnic administrative units, including even ethnic republics. Ethnic minority groups have seen their decision-making powers curtailed: by the use of presidential decrees (by definition, undemocratic), and the notorious ‘power vertical,’ which makes it possible to rush laws through a rubber-stamp parliament,without any meaningful debate. None of the above, however, pleases Russian ultra-nationalists. They are hostile towards all immigrants (particularly migrant workers from former Soviet states). Even the presidential decree on the Nationalities Policy Strategy angered the ultra-nationalists, with its references, however vague, to the protection of minority languages and cultures, which they interpret as not sufficiently affirming the primacy of Russian identity. Like the Soviets, then, the Russian leadership seeks to maintain political stability through careful ethnic diversity management, forging a spurious civic identity rooted in flag-waving rhetoric and stage-managed opposition to the West. Yet, this policy satisfies neither Russian nationalists nor the advocates of ethnic minority rights. Moreover, playing the nationalist card, ethnic or otherwise, and making Russian people proud about themselves, can backfire: the recent ban on US adoptions, triggered by the death of a Russian child adopted by an American family, sparked large-scale anti-government public protests in January, with demonstrators outraged that children in overcrowded Russian orphanages should be used as pawns in an international political game. That is what is called civil society – the result of all that talk about civic values…. The government response was to up the ante: a pro-Kremlin demonstration on 2nd March urged the government to extend the adoption ban to all foreign nationals, and to ease domestic adoption rules. President Putin has chosen statism as a strategy. Dissension, of whatever persuasion, is anathema: political parties, based on ethnicity or religion are banned; but so is the Movement Against Illegal Immigration, whose extreme, ultra-right message makes it a potentially destabilising element. To the annoyance of the nationalists, the marginalisation of minority cultures is not presented as a policy inspired by Russian neo-imperialist motives but rather by a management drive in head office to strengthen the state. To the annoyance of the ethnic minorities, there is no dialogue between cultures, only a dominant Russian culture around which other minority groups are allowed to dance but not to speak. The Soviet Union did manage to produce one homo sovieticus – Vladimir Putin. In a country with a managed democracy, should we be surprised that Russia also has a managed ideology? Frederica Prina is Senior Research Associate at the European Centre for Minority Issues (ECMI). She completed her PhD on the role of international mechanisms in promoting the cultural rights of national minorities in the Russian Federation at UCL-SSEES in 2012. This article was first published by Open Democracy as part of its CEELBAS Debate Frontlines series on politics and culture in the post-Soviet space. It is reproduced here under the terms of a Creative Commons license [CC-BY-NC]. The Centre for East European Language-Based Area Studies (CEELBAS) is a partnership between the universities of Bath, Birmingham, Cambridge, Kent, Manchester, Oxford, Sheffield, Warwick, the School of Oriental and African Studies and UCL, which is based at UCL-SSEES.